I bought this souvenir case full of coasters from a cruise ship called the S.S. Homeric several years ago at a rummage sale in NJ. The case and coasters were in such good condition that my fellow vintage hounds were skeptical that they were legit—they figured they must be some Restoration Hardware knockoff. But, no, they're real. The S.S. Homeric—then known as the S.S. Mariposa—was a luxury ocean liner that launched in 1931 and by the 1960s cruised the Caribbean for the Italian shipping company Home Lines. No, this is not something I knew when I bought them; I learned it from this handy website for devotees of cruising, which features a totally great video of a bunch of pasty white folks clad in ’60s resort attire, playing bizarre and somewhat risque games on deck during a Homeric cruise to Barbados. I took a Royal Caribbean cruise to Barbados (and four other islands) back in the ’90s. Have you ever been on a cruise? Well, I highly recommend it, IF (a) you have the right attitude and (b) someone else is paying. I was able to fulfill both criteria: I was in my late 20s when F-U-N was priority one, and my in-laws foot the bill. My in-laws, who were laboring under the misapprehension that cruises were all classy like in Cary Grant movies and Titanic and Atlantic crossings on the QE2 and probably what the S.S. Homeric was like back in the ’30s and ’40s. Swanky! Exclusive! 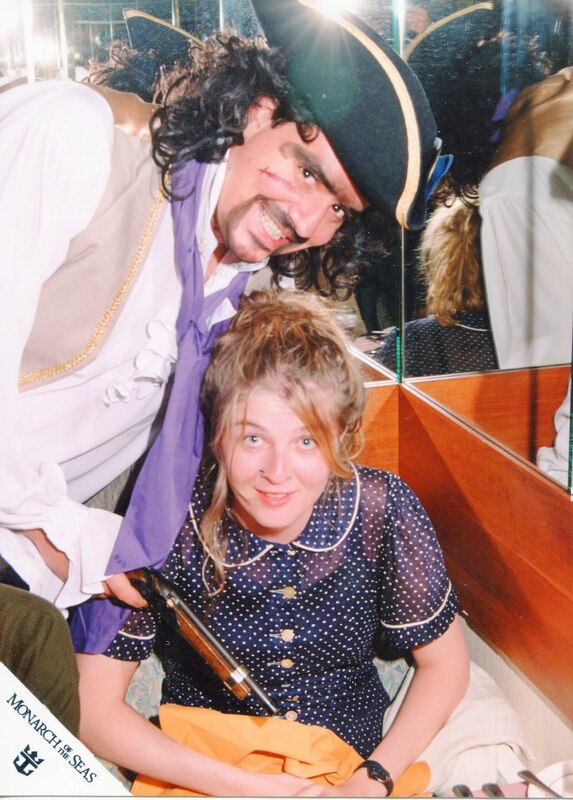 But, no, cruises are ridiculous, and as it happened, Lindsay and I were totally prepared because David Foster Wallace's hilarious and cruel essay about his cruise experience was published in Harper's only months before we embarked. The cruise experience is the opposite of classy and you've got to be able to embrace that or you won't survive. So we hot-tubbed with strangers and played shuffleboard and rallied for muster at an ungodly hour and drank too many umbrella drinks and got sea sick and hit the slots and played a colossal game of bingo with 1,000 fellow passengers and saw the Spinners perform "Rubber Band Man" live and went to discos and groveled before a cream cheese mermaid at the midnight buffet while my in-laws stewed and smoldered. The photo of me below, posing joyfully with a pirate who appears to be aiming his gun directly into my lap, is one of several photo souvenirs I've saved from the trip, along with a pair of very hideous complimentary Royal Caribbean glasses, which are always right next to the bag destined for Goodwill though somehow they never quite make it in. Maybe that's how the person who owned these S.S. Homeric coasters felt. He/she obviously never used them because they are pristine. And I've never used the coasters either; in fact, I'd forgotten all about them until I decided to clean out my sideboard a few weeks ago (the sideboard is full of forgotten stuff like this. Pretty sure that along with housing the holiday china, that's all sideboards are really good for). 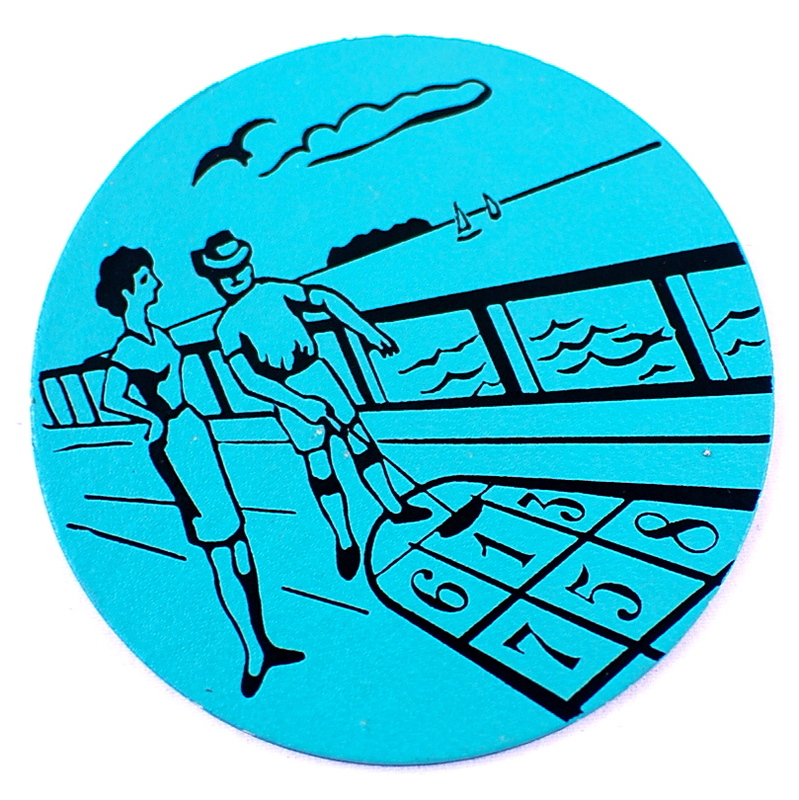 And I still can't see myself using them, or getting rid of them because they really are cute and they remind me of my own excellent cruising adventure (I mean, all of the scenes depicted on the coasters went down on my cruise too). Plus, the Homeric was scrapped in 1973 after a serious fire—so what remains of the old ship? Perhaps I should just save these and finally take my Royal Caribbean glasses to Goodwill, where they can remain for a decade or so, till some youngster who collects ’90s kitsch snaps them up. May the circle of stuff be unbroken. Hilarious! You always loved an interactive period actor! Very funny. I've never cruised and never want to, but the coasters are cool, you should use them. p.s. read At Sea by Laurie Graham, based on a cruise, its great.